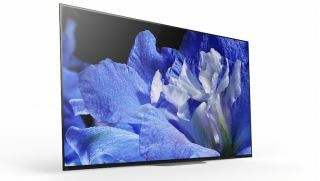 Sony unveils AF8 Series of 4K HDR OLED TVs | What Hi-Fi? Sony's second generation of OLED TVs is available in 55in and 65in screen sizes and will go on sale in Spring. 2017 saw Sony's A1 OLED range take the TV market by storm and a year later its second-generation sets are here and we can't wait to get our hands on one. The AF8 range uses the same X1 Extreme picture processor and Acoustic Surface technology that debuted on the A1, but the stand design has been revamped - the AF8 now has a tiny stand that protrudes from under the bottom of the TV. Launching alongside the OLED range is a new premium range of LCD TVs. Sony's XF90 line-up includes 49, 55, 65 and 75in models and uses the same X1 Extreme picture processor as its new OLED siblings. It also uses Sony's new X-Motion Clarity technology which Sony claims can help with, you guessed it, motion handling. HLG, HDR10 and Dolby Vision HDR will all be supported by both ranges, but Dolby Vision will come as part of a firmware update at a later date. The sets will also support commands from smart speakers made by Google and Amazon. Both Sony's AF8 and XF90 TV ranges are due to hit shops in Spring 2018 with pricing TBC.